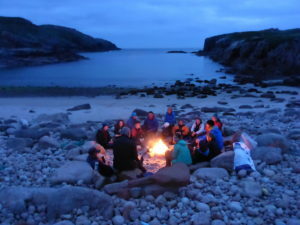 Midsummer camping and climbing on Gola Island 22nd- 24th June. Sabba is the boatman (phone: 0872245881), whose ferry departs from Magheragallon Pier, Bunbeg. According to his facebook page here boats leave 11.00 AM and 2.00PM daily, but he seems to post on the page regarding next day's sailings. Best to ring him and check, as this may change due to tide and weather. Camp site marked on the map below. This year's christmas abseil will be a trip through King's Gully on Benbulbin, Co.Sligo on 8th December, followed by dinner and a pint somewhere local. Some people probably staying down in Sligo on Saturday night. Contact Valli for more detailed info. First aid course being hosted for club members in Campsie, near Eglinton on 11th December. Contact Dennis for more information. Connemara Hillwalking Weekend. Contact Margaret for more information on accomodation arrangements etc. Weekend in the Mournes with possibilities for walking, climbing, biking or running. Contact Anthony for more information on accomodation, camping venues etc. Mountain festival in Killarney, with films, guest speakers and lots of outdoor activities, good excuse for a weekend away in Kerry, with the Reeks at your doorstep. An opportunity for those who have been climbing indoors but want to make the transition to real rock to come along and get some guidance or just try it out. New-comers of any experience level welcome to come along as well. Second week of the Resin 2 Rock sessions, which are an opportunity for those who have been climbing indoors but want to make the transition to real rock to come along and get some guidance or just try it out. New-comers of any experience level welcome to come along as well.